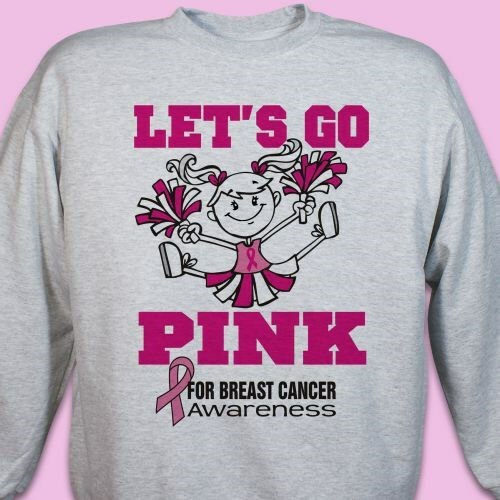 Show off your Breast Cancer Awareness Spirit and go PINK with this fun awareness sweatshirt. This great design is perfect for supporting breast cancer awareness at events, walks or just doing your day to day activities. This Breast Cancer Awareness design is printed on our premium, 50/50 cotton/poly blend sweatshirts, machine washable in youth sizes XS-L and adult sizes S-3XL. Additional Info Show your support for breast cancer when you shop our collection of Breast Cancer Apparel and Walk Gear, from MyWalkGear.com. This great design is sure to catch the attention of all! It is also available as our Let's Go Pink T-Shirt and our Let's Go Pink Hooded Sweatshirt as well.